We fly all year round, over the Cradle of Humankind, Magaliesberg, and selected game reserves. As a 6 time tourism award winning company, an established commercial hot-air balloon operation with the Civil Aviation Authority, and having flown thousands of satisfied passengers with a 100% safety record, AirVentures is well positioned to offer passengers a safe and memorable flight experience. We offer two different flight packages, the Classic Flight and Safari Flight experiences on either one of our larger passenger balloons or on our Exclusive balloon flight for two. 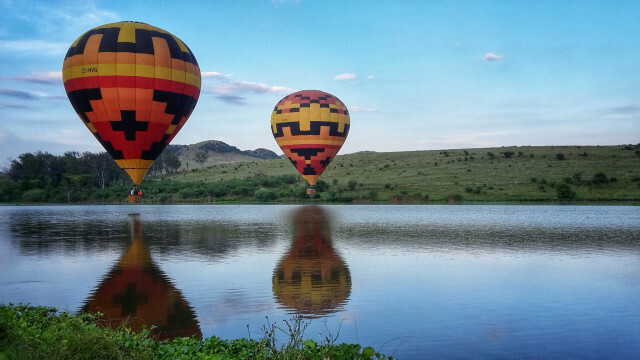 The pilot allows the balloon at times to drift at tree top height and at other times will ascend into the skies, offering guests a panoramic view of the beautiful African landscape below. Both flight packages include tea/coffee and biscuits on arrival, a flight of approximately an hour, sparkling wine and orange juice celebration on landing, breakfast at a 5 star lodge, and flight certificates presented by the pilot.